Fall is in the air at the Ostrich with a fresh new lineup of cocktails, carefully crafted by Brandon Casey and his team. With ingredients like figgy pudding bitters, yellow chartreuse, dessert blossom honey syrup and dehydrated mulling spices – the New Fangled Fall cocktails are an absolute necessity to ring autumn into season. The new menu is available beginning, August 30, 2016. Drawing inspiration from classic cocktails and breathing autumn life into them, these redesigned classics pay homage to their roots while embracing new and local ingredients. The new cocktail menu features spirits from all over the world paired with local ingredients to help both reach their ultimate potential. We’ve married sweet, smoke, spice and citric to create a collection of drinks that are perfect for fall.” Said Brandon Casey, Beverage Director & Mixologist, the Ostrich. The Butcher, The Baker and The Candlestick maker are drinks inspired by the nursery rhyme “rub-a-dub-dub” published in the late 17th and early 18th centuries. This rhyme depicts three respectable townsfolk heading out of town to the fair, to do something dubious. Returning home, a bath is most certainly in order. At the Ostrich, cocktail fans shall enjoy a touch of theatrical entertainment that will accompany this fine fall mixology showmanship. Here’s a peak at a few of the featured cocktails. For more information about the Ostrich and to view the complete menu, visit: crustrestaurants.com/ostrich. Also, stay tuned to the Ostrich Facebook page for upcoming events and specials at facebook.com/theostrichbar. 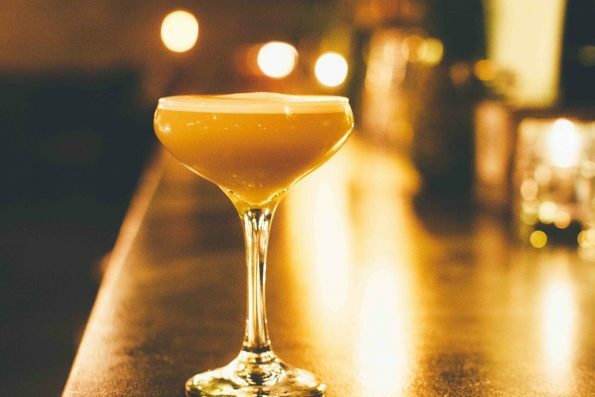 Located directly below Crust Chandler, the Ostrich is a neighborhood craft cocktail lounge inspired by the rich history dating back to the city’s founding days of 1912. Classic drinks, historical furniture and timeless service have established the Ostrich as an east valley craft cocktail destination. Handcrafted ice, cocktails, food and hospitality is the name of the game at the Ostrich. Cocktails are serious business, so the Ostrich is home to a star studded staff, led by nationally celebrated mixologist, Brandon Casey and supported by Maxton Kennedy, an extremely talented second in command and a new valley transplant all the way from New Orleans. The Ostrich is open Tuesday-Saturday at 6 p.m. at 10 N San Marcos Place, Chandler, AZ 85225.